There are many prophets in the Bible, and if you ask around who’s the greatest prophet, there will surely be some who will answer Elijah. 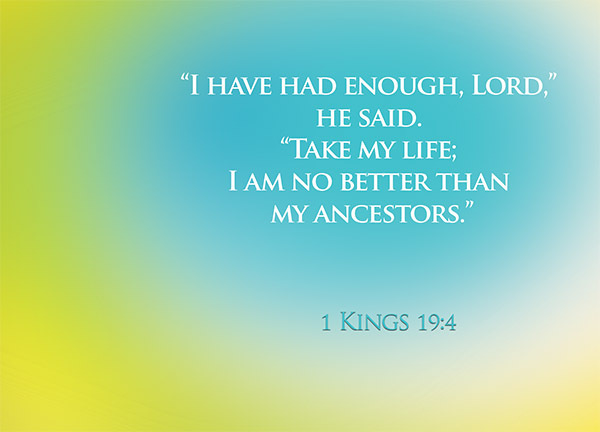 Most of the prophets from the Bible did not have good lives. They suffer and suffer and suffer in various ways, toiling for the Lord. In fact, practically all the prophets have very interesting stories. Yet even among all these stories Elijah stood out the most. Lets not even talk about the great things he had done for God – there were so many – but just the fact that he was one of only two people stated in the Bible who didn’t die makes he a very unique character. Elijah was also the direct teacher of another well-known great prophet, Elisha; and by 1 Kings 19, Elijah had already prophesied a Great Drought, revived the son of a widow, had a confrontation with the 450 prophets of Baal, called for fire from the heavens, killed Baal’s prophets by the sword, and brought about a heavy rain, ending the drought. The first two verses of 1 Kings 19 are essentially a death threat by Jezebel [1 Kings 19:2] and that was the last straw. Something in Elijah snapped and he ran away in fear. In today’s terms we would probably call it a burnout – a major burnout bordering on depression. It was bad enough for him to want to die. In today’s study, we will look specifically into why God did not take his life away. prayed that he might die – just a side-note, if Elijah prayed for God to take his life, and God listened to his prayer and took his life, would it be considered a suicide or what? Have you ever heard of people who prayed to God, “God, please kill me” ? Isn’t that a little bit strange? I’m sure there are people who had prayed such a thing before, but I’ve personally not heard of it – all kinds of alarm bells will ring in my head if I ever hear of anyone I know praying such a thing. It’s strange after all, isn’t it? If a person truly wanted to die – not that I’m advocating it – he’ll likely go ahead and take his own life already. Why pray for God to take your life when you can do it yourself? What kind of psychology is it for a person to pray for God to take his life? Is that really a sign of a person who truly wants to die? I am no psychologist, but I personally do not think so. I do not doubt the extent of Elijah’s misery at the point of his dark prayer. I do not think he was exaggerating when he said he wanted to die, but I don’t think he truly wanted to die either. The human mind is kinda amazing – after all, God created it. When you are miserable, you will naturally turn to a place where you can find comfort. To Elijah, that place was with God. In his misery and fear, in his discouraged and disillusioned state – or as we say today, burnout and depressed; the one he turned to was not the kings or other prophets on earth, but God. In essence, by telling God that he wanted to die, the hidden message was really, God, I can’t take this anymore, please do something to alleviate my sufferings! If our God is not omniscient and merely grants prayers on a whim, Elijah would be long dead. Like, seriously dead, hello – this is Elijah we’re speaking about! He said no rain, and it stopped raining for years [1 Kings 17:1]. He asked for fire, and fire fell [1 Kings 18:38]. This is Elijah – how hard is it to grant his prayer and take his life, if even his prayer for fire was heard and granted? If God regarded him simply by his words and his actions, Elijah’s request would have been granted. But our God is not like that. Our God knows us best. After all, he created us. He knows our true feelings and desires, our deepest needs underneath all the superficial appearances that we keep up – even if our bodies put up an act to fool others, even if our hearts deceive ourselves in a moment of weakness, God can see through all that and understand what we truly need. If Elijah’s prayer was heard, and his request to die granted, the moment he was done with his prayer and had fallen asleep, he would have peacefully died – that would be a nice little movie ending. Suicide by prayer. How strange. Anyway, that didn’t happen, but the most important thing is, despite not killing, God had granted Elijah’s request. Remember? In essence, when Elijah told God to take his life, he didn’t really want to die, but he was actually pleading for God to do something to alleviate his afflictions. Elijah fell alsleep, and – note this – all at once an angel touched him and told him to get up and eat [1 Kings 19:5]. God heard his prayer, and granted his request immediately. An angel was sent – not to kill him, but to feed him and to restore his energy [1 Kings 19:7-8]. Feeding him was a physical replenishment. He would soon have his spiritual replenishment. God personally promised him protection of several layers [1 Kings 19:17] . On top of that, it was at this point that God told him to anoint Elisha to succeed him as prophet. For the rest of Elijah’s time on earth, Elisha acted as his attendant and disciple, learning from him and at the same time, sharing perhaps a little of his load. God knew what Elijah needed. God gave him what he needed. It is no secret that Elijah became a great prophet – a prophet who had double portion of Elijah’s spirit [2 Kings 2:9]. You can count all of Elijah’s deeds and acts – but perhaps the greatest of all would be his mentoring of Elijah. Perhaps a little ironically, Elijah never died. Elijah who asked to die in 1 Kings 19:4 never died. Eventually, a chariot of fire and horses of fire appeared and brought Elijah up to heaven in a whirlwind [2 Kings 2:11]. Forgive my choice of words, but isn’t that just mind-blowing? We know little about the story of Enoch since not much was written of him in the Bible, but we know Elijah’s story. What kind of honour is it to be brought to heaven without dying? There are so many great and noble men of God in the Bible – surely the work of Moses, Abraham or David were greater than that of Elijah’s. Job, called the greatest man of the East [Job 1:3], died too [Job 42:17]. Even Christ had to die – even though that’s a different case altogether. Elisha, who possessed double of Elijah’s spirit, died too. What an honour. If Elijah had died back then, he would have missed out on so much. Thankfully, God is great. He knew Elijah best, and gave him the best beyond what he could have ever imagined.